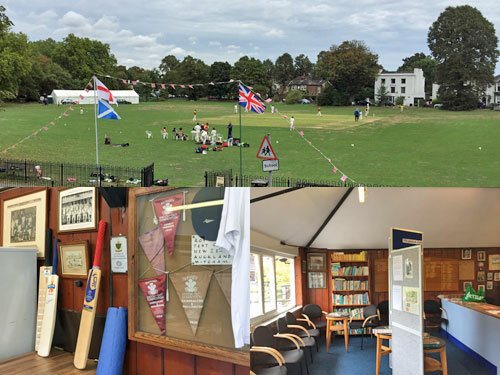 This annual event, run by Mitcham Cricket Green Community and Heritage, in conjunction with Merton Council and Heritage Open Days, showcase some of the great heritage on and around Mitcham's historic Cricket Green. This year eight locations took part. I'd best start with the Cricket Green itself. There's been a cricket ground at the heart of Mitcham since 1685, making it the oldest continuously used cricket ground in the world. But maybe not for much longer, in a properly depressing story of greedy developers out to make a buck. 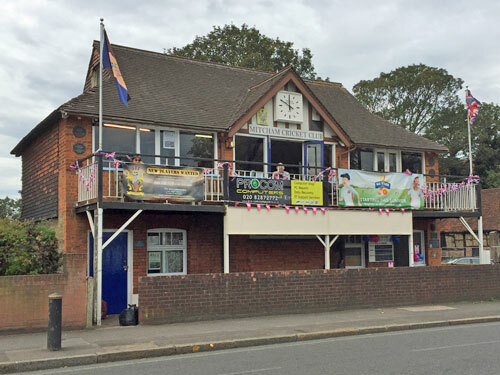 The current cricket pavilion was built in 1904, before which players had to get changed in the pub. It's unusual in being located on the other side of a main road, so players have to cross the busy A239 when going in to bat. There's also a good view from the balcony, as I discovered yesterday when they opened up the building to non-members. The elderly gent in the clubhouse wasn't initially impressed when I answered, truthfully, that I'm not particularly into cricket. But we bonded rather better over threatened heritage, and the ongoing plans of Phoenix Group Investments to develop the site behind the pavilion. They bought the lease off Punch Taverns in 2008, closed down the Burn Bullock pub on the corner (it's still empty) and continue to make noises about building a hotel. Meanwhile the cricket club's equipment shed is under threat, the pavilion's lease is up in the air, and nobody seems willing to confirm or settle anything until planning permission has been granted. Next season's secure, but future uncertainty is doing the club no favours. The pavilion's upper room is a bit of a shrine to the club, with old photos and plaques around the walls, a library of cricket-related reading matter down the far end and a table of Wisdens beside the comfy chairs. The men's honours board goes back some distance, but the latest names have a rather more Commonwealth feel, while the women's board covers only the 2018 season. "We have Lashings playing here tomorrow, although you probably don't know who they are," said the old gent, before straining to hear the latest Test score on the Smart TV. So if you like a celeb-filled one-day fundraiser, Mitcham's the place to be today... and hopefully for years to come. Refreshment options: Tea and cakes from the ladies in the corner kitchen, who rightly spotted that salted caramel makes an excellent topping for the dainty treat those of us aged 40 and over always called a cupcake. The oldest surviving building in Mitcham, and indeed in Merton, is a dovecote. And not a small dainty box on a pole either, but a tall square building with a hipped tiled roof originally used as a battery farm for Tudor dining. It was built in 1511 for the priory and convent of St Mary Overie in Southwark, and overlooks a former monastic carp pond. It's also a bit run down, so you don't get to go inside without being on a special tour. In good news, the dovecote is no longer full of birds, otherwise the floor would be a lot ickier. But in its heyday, blimey, the racket and mess must have been intense. 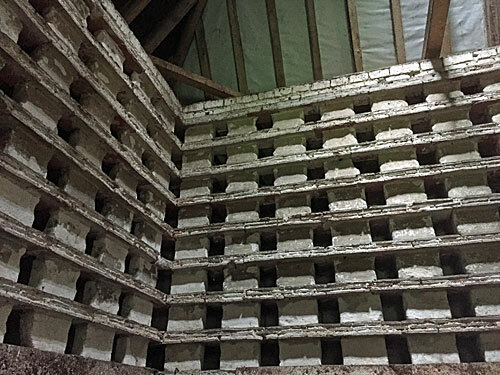 Every wall contains rows of square recesses for nesting in, stacked 15 layers high, which we calculated to be somewhere above 600 individual spaces. And the occupants would have provided all the eggs the monks needed, plus ample flesh for cooking purposes when the time was right. It's a striking and memorable interior. 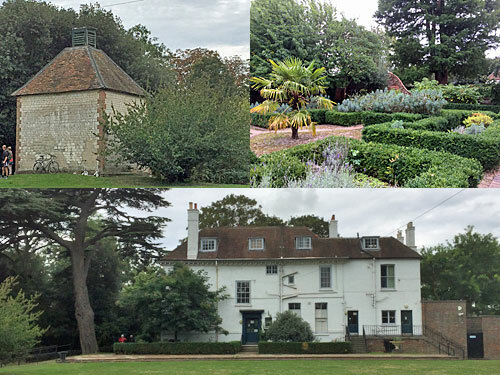 A considerable-sized lottery grant has recently been awarded for the restoration of the dovecote, and more specifically the adjacent house and gardens. The Canons is early Georgian, and will be fitted out for offices with an additional heritage and community space in the basement. The walled garden is already a treat, but will be repaired and spruced up, and some of the hedges will be lowered to open up the vista to regular users of the adjacent Leisure Centre who may never have spotted what lies beyond. A cafe is also planned, of course, because this end of Mitcham genuinely doesn't have enough drop-in caffeination opportunities. The project staff I met are keen, and if you come back in four years time an amazing transformation should have been wrought. Refreshment options: None. Dove's been off the menu for some time. 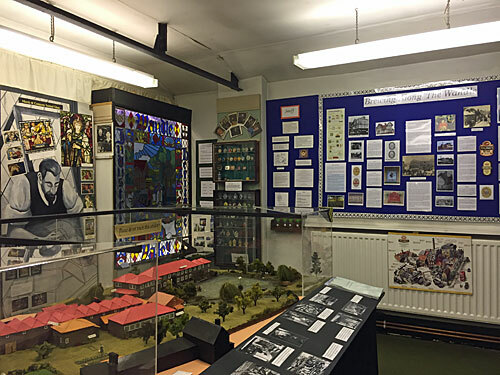 Offering a heritage focus on life down the Wandle valley since 1983, this avowedly amateur museum is a proper little treasure trove. It's been located in a 'temporary' building for over twenty years, the distinctly lowly-looking annexe to the Vestry Hall near Cricket Green. Wednesday and Sunday afternoons are the time to turn up if it's not Heritage Open Days weekend, and expect to pay the utterly amazingly low admission fee of 50p... which those of us visiting yesterday got to waive. It's like a little scout hut inside, but rammed with stuff, most of which is either illustrated information around the walls, or models of places in the centre. 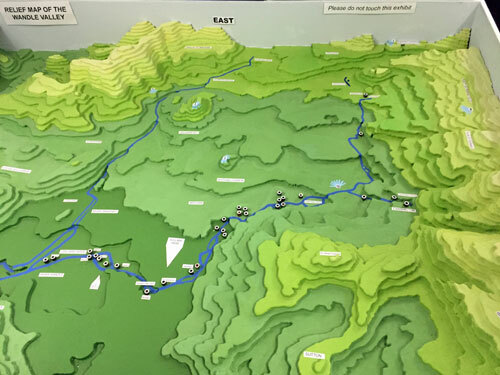 One of the models is a contour map of the Wandle valley, made from slices of painted polystyrene, which works surprisingly well to explain the local geography. Another shows the complex at Merton Abbey Mills, and other the Abbey whose foundations survive beneath the relief road. As for the wealth of information, the Wandle valley can boast arguably the first ever railway line, a whole host of breweries and acres and acres of lavender production, so there's a considerable amount to read. The museum's greatest strength is its volunteers, who put their heart and soul into the place and are always up for a chat. The Open Day allowed access into their back office, ostensibly to view a photographic display that wouldn't have fitted up front, but also revealed a paper-filled reservoir of box files, mugs and pinned-up rotas. It is lovely how various parts of London have places where like-minded heritage-friendly souls can assemble and keep the memories of long-swallowed suburbs alive. Refreshment options: None. Strictly staff only. A surprisingly lofty church, mostly Victorian but with medieval footings to the tower, its first recorded priest taking office in the 13th century. I met the cheery current incumbent, and a number of keen parishioners, but missed out on the belfry climb. Refreshment options: The ginger-spiced flapjacks were totally yummy. 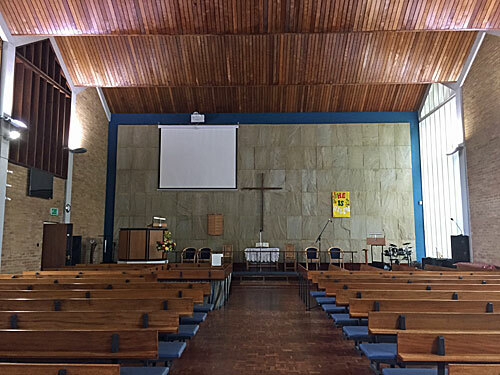 A mere youngster, dating back to 1958, but the unusual concertina-roof design got it Grade II listed. I'd like to apologise to the volunteers out front for not signing the attendance sheet, but sneaking out the backway instead. Refreshment options: Tea, insistently offered. Facing Three Kings Pond, this mock Tudor building's not even the original pub, which was demolished in the 1920s. It was rebuilt by the family of the Poluski Brothers, a pair of famous music hall artistes who'd previously run the original venue. After the pub fell derelict in 2012 a developer built a row of houses in the beer garden, but transformed the pub into offices for a software company, who yesterday put on a bit of an exhibition beyond the programming desks. Refreshment options: Free barbecue? Cheers. I took full advantage of a freshly-prodded boerewors hot dog. 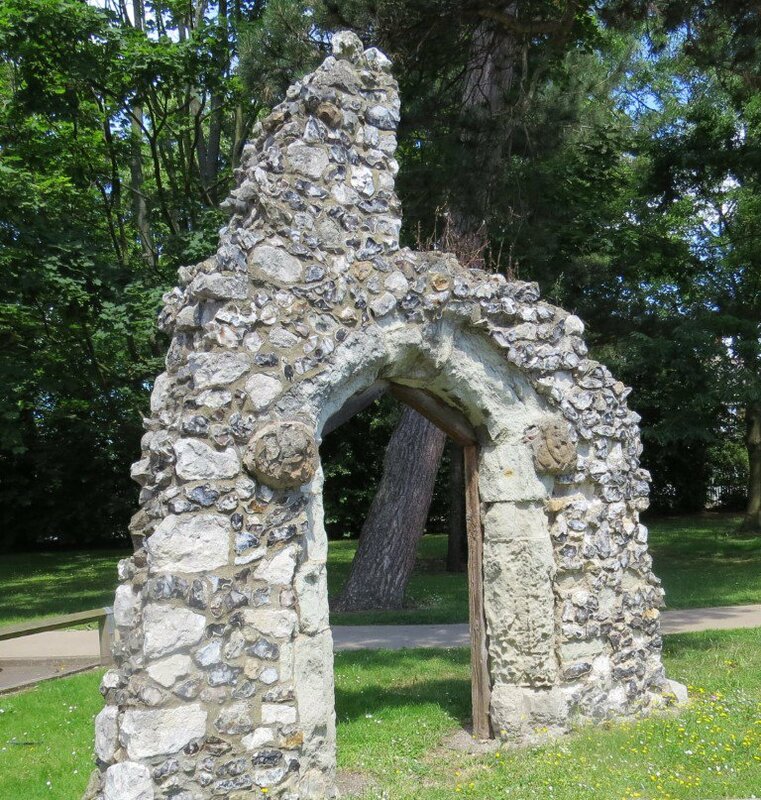 Where some primary schools might have a small climbing frame out front by the car park, this one has a leftover medieval arch from 14th century Hall Place. Proud winners of the Wimbledon District Weekend League 2016. They weren't the busiest of the eight locations. » Keep up to date with Mitcham Cricket Green Community & Heritage online and on Twitter. » If you're interested in all things Mertony-Suttony, this weekend is also the start of Wandle Fortnight. » Heritage Open Days continue across the country today and next weekend. I think Amersham, Chesham and the interconnecting vintage buses may get my vote today.